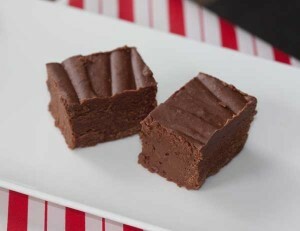 A creamy fudge made without a candy thermometer. This fudge tastes better after it's been frozen and thawed. I included the brand names and types of chocolate chips because they are key (other brands will give you different tastes and texture). Line the inside of a 9x13 inch metal pan with nonstick foil. In a large heat-proof mixing bowl, combine the softened butter with the salt, marshmallow cream, vanilla and chocolate chips. Grease the sides only of a heavy 4 quart pot (I use a Le Creuset French pot) with butter to help prevent sugar crystals forming. In the greased 4 quart pot, combine the sugar and evaporated milk. Bring to a boil over medium heat, stirring often. As soon as the mixture reaches a boil, reduce temperature to the lowest temperature you can use that will still maintain a boil. Set the timer for 8 minutes and boil, stirring every so often to prevent scorching. As soon as the timer rings, pour the mixture into the bowl with the other ingredients. When you pour it, do not scrape the bottom (especially if some scorching occurred) and beat with a spoon until smooth. Pour fudge into the pan. At this point it should be soft and you may worry that it is undercooked. Allow it to sit at room temperature for two hours, then transfer to the refrigerator and chill until firm. Remove from pan, cut into three sections and wrap each section tightly. Freeze overnight. When ready to serve, unwrap one of your sections and cut it while its frozen or semi-frozen. Let it come to room temperature before serving. Store this fudge in the freezer or refrigerator.